2. Touch to select Apps menu. 3. Select Settings to proceed. 4. Scroll down and select More Networks from the Network Connections option. If Mobile Data is unchecked, be sure to check it. If Mobile Data is already checked, proceed to the next step. 6. 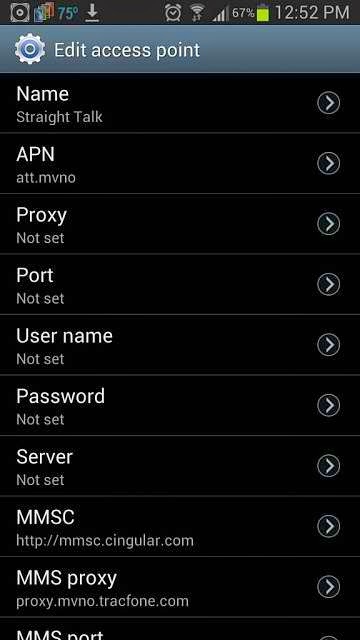 Touch to select Access Point Names or APN. 7. Select the + sign to continue. 8. Type in T-Mobile under Name. 9. Type in epc.t.mobile.com under APN. 10. Leave the Proxy, Port, Username, Password fields blank or do not type anything on these fields. 11. Type 310 in the MCC field. 12. Type 260 in the MNC field. 13. Put a check mark on PAP under Authentication type. If prompted, enter or type in default (in lower case) and then select OK to continue. If not prompted, put a check on Internet option instead. 15. Select the Options sign/symbol to continue. 16. Touch on Save to save current settings. 17. Put a check on T-Mobile option. 18. Go back to the Home screen. 20. Touch on Internet to continue. 21. Select the Options sign/symbol. 22. Scroll down and select Settings. 23. Select the option Set Homepage. 24. Put a check on Other. 26. Select OK to continue. 27. Touch Done to complete the process. 28. Go back to the Home screen. You now have configured your Samsung Galaxy S5 for mobile internet. The device is also set up for data so if you have an available data coverage, you can try to access the Internet or browse a website to see if the connection works.